This past spring, Calibrate Legal partnered with Intapp on a survey of senior law firm marketing and BD executives on the topic of Growth Enablement. The survey results will be published later this year. Meanwhile, we want to focus on one important research finding – a mismatch in the accountabilities of Chief Marketing Officers for law firm growth. More than half of survey respondents told us that the CMO has “top chair” accountability for growth in their firms. But when we asked who developed growth strategy, it was clear that CMOs deferred to CEOs, managing partners, and others. Only 11% of respondents agreed that responsibility for growth strategy rested with the CMO – suggesting that CMO roles may be more operational than strategic. 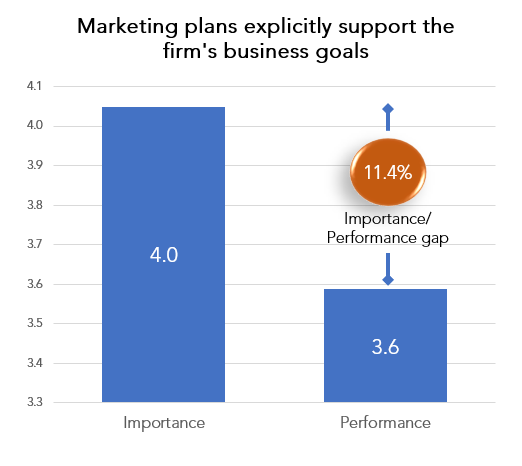 Similar findings showed up in Calibrate Legal’s 2017 Marketing Operations research study, where we found a large importance/performance gap in marketing’s alignment to the firm’s strategy. At Calibrate Legal, we believe that the overarching purpose of marketing and BD is to accelerate the firm’s revenue growth. To accomplish that, marketing/BD leaders need to align their programs and deliverables with the direction of the firm – and should have a seat at the table for the firm’s strategic planning process. If you’re a law firm seeking to hire fresh marketing leadership – search for candidates with the business acumen and boardroom skills to advocate for growth within your partnership. If you’re looking to advance your career in legal marketing – assess your current strengths and development areas as a Revenue Enabler™, and work on improving them. Your future success depends on it. Calibrate Legal’s services in Recruitment, Talent Consulting and Marketing Operations can help you build a marketing/BD team that is fully aligned to growth. To discuss your needs, reach out to Jennifer Scalzi, CEO or Susan Van Dyke, Chief Client Officer. We look forward to helping you!